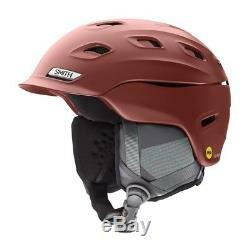 Smith Optics Vantage MIPS Snow Helmet (Matte Oxide/ Large). Highly protective helmet with superior ventilation. Effective dual control ventilation system. The Smith Optics Vantage MIPS Snow Helmet combines advanced technology with comfort and style to deliver maximum comfort and protection. Superior buffer is ensured using Aerocore construction featuring Koroyd, while excellent fit is guaranteed thanks to the advanced adjustable sizing control. Combine these features with goggle integration, nanosilver lining, low-profile dual regulator adjustable climate control amd AirEvac ventilation and you're all set for a fun-filled day on the slopes. Using a combination of materials such as EPS and Koroyd, a revolutionary impact absorbing and airflow increasing material, Smith Optics developed Aerocore construction which allows for more vents to be placed throughout the helmet without sacrificing protection and comfort. MIPS is used to reduce the rotational forces to the brain in the case of an oblique impact. Smith helmets are created to absorb direct impacts very efficiently and when combined with MIPS, Smith helmets absorb oblique forces better by allowing a small rotation of the outer shell relative to the liner. When you fall to the ground at an angle rotational forces are generated. A helmet integrating MIPS technology creates a sliding layer between the outer shell and the head. This allows the helmet's outer shell to slide relative to the head when hitting the ground, so the rotational force is decreased, reducing the potential to damage your brain. Smith's Hybrid Shell construction combines separate lightweight and durable shells to create an entirely new helmet category. By fusing the tough bombshell ABS construction with flyweight In-Mold technology, Smith Optics Hybrid Shell construction optimizes the favorable traits of each material in this revolutionary process. The result is a modern design that provides a lightweight, low profiles, perfectly fitting helmet. Hybrid Shell construction also creates a clean, smooth top surface by enabling the low profiles Regulator to function with reduced mass and volume. Goggles fog when standard helmets trap warm, moist air in the goggle chamber. Smith's AirEvac ventilation systems generate maximum airflow and pull warm, fog-causing air out of the goggle. The warm air is allowed to exhaust out of the top of the goggle and begin its path through the helmet's AirEvac system. Temperature control is the most important feature when considering how to enjoy the entire day on the hill. Smith Optics Dual Regulator ventilation system independently controls the front and rear sections of the Vantage venting, allowing you to modulate your body temperature even in extremely cold conditions. By exhausting heat through the rear vents while maintaining a sealed front end, your body can eff ectively cool down if needed and avoid the dreaded ice cream headache. Taking customized fit to the next level, Smith introduces the Boa FS360 Fit System. With a full 360 degree halo design, this system advances the category by offering both forward and lateral fit adjustments. Feel the fit system snug to the head in a full halo, allowing for a "floating" effect that eliminates helmet hot spots. Offering Boa's standard intuitive dial system for on-the-fly micro-adjustability, along with vertical adjustment options, the Boa FS360 Fit System is a best-in-class fit system, offered in Smith's market-leading Vantage helmet. What's in the Box. Weight: 17.5 oz/ 500grams. Certification: ASTM F 2040, CE EN 1077:2007 Class B, CSPC, CE EN 1088. F There are product categories which are not returnable due to hygienic or sanitary as required by manufacturers. In an event where there is an error regarding a price error or description, we will notify you ASAP. Items removed from their'blister-pack' display packaging are non-refundable. The item "Smith Optics Vantage MIPS Snow Helmet (Matte Oxide/ Large)" is in sale since Wednesday, October 10, 2018. This item is in the category "Sporting Goods\Winter Sports\Clothing\Protective Gear". The seller is "asavings" and is located in Brooklyn, New York. This item can be shipped to United States, Canada, United Kingdom, Denmark, Romania, Slovakia, Bulgaria, Czech republic, Finland, Hungary, Latvia, Lithuania, Malta, Estonia, Australia, Greece, Portugal, Cyprus, Slovenia, Japan, China, Sweden, South Korea, Indonesia, Taiwan, South africa, Thailand, Belgium, France, Hong Kong, Ireland, Netherlands, Poland, Spain, Italy, Germany, Austria, Bahamas, Israel, Mexico, New Zealand, Philippines, Singapore, Switzerland, Norway, Saudi arabia, Ukraine, United arab emirates, Qatar, Kuwait, Bahrain, Croatia, Brazil, Chile, Colombia, Costa rica, Panama, Trinidad and tobago, Guatemala, Honduras, Jamaica, Viet nam.